Ping, Apple’s music social network on iTunes, is an ultra-exclusive club. And by ultra-exclusive, I mean it’s an incredibly empty service. Since launching in September, little more than 2,000 artists have joined Ping, reports Hypebot–a remarkably low number given that the iTunes store is the top music retailer in the country. MySpace, for all its woes, boasts more than eight million artists. Such non-existent participation from the participants who matter most on a music social network — musicians — should come as no surprise. Ping has far too many roadblocks to be popular. From the very beginning, Apple stumbled, circumventing the record labels and reaching out only to a small assortment of artists directly, such as Lady Gaga and Yo-Yo Ma. Perhaps Jobs was hoping to cut out the middleman, but his piecemeal approach wasn’t enough to draw in fans by the droves. Apple has been adding artists one by one, in a painfully slow process, posting only profiles that Apple deems worthy. What’s more, Apple created a bizarre nine-page book of guidelines, full of rules that would hinder any rock star (or Kanye wannabe) from joining. 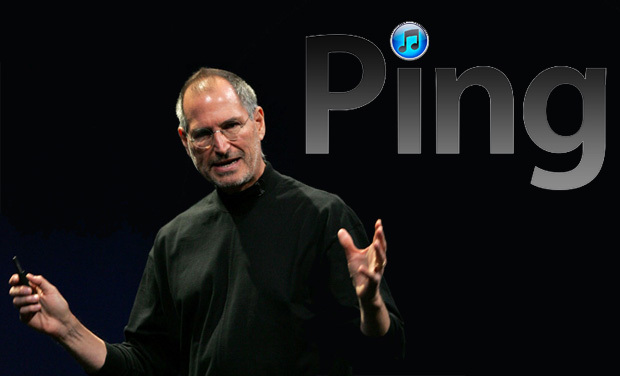 When Jobs first introduced the service, he boasted of iTunes’ 160 million users, as if these users would automatically sign up for Ping. Judging from how few artists have joined, there seems little incentive to join such a walled-off and slow-growing social network. Lady Gaga has more than 21 million fans on Facebook. Even on the relatively neglected MySpace, she has about 1.3 million followers. And on Ping? a mere 575,000. Between the lack of Facebook connectivity, low artist count, and lack of user interest, in short, Ping seems dead in the water.